Taylor Hidalgo can feel the walls closing in around him. As the walls tighten, tensions soar, and pretty soon several will die—the situation feels inevitable. 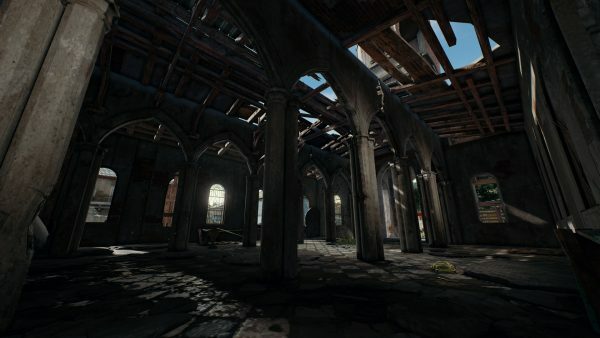 PlayerUnknown’s Battlegrounds (henceforth PlUnkBat) is a game about both physical and mental barriers, establishing space, losing territory, and hoarding guns. It always feels like a minefield. Remote locations away from other players never feel safe for long, owing to an implacably constricting, endlessly patient blue boundary that closes in on the island, slowly killing those on the outside. The shrinking safe zone teems with unseen assailants. 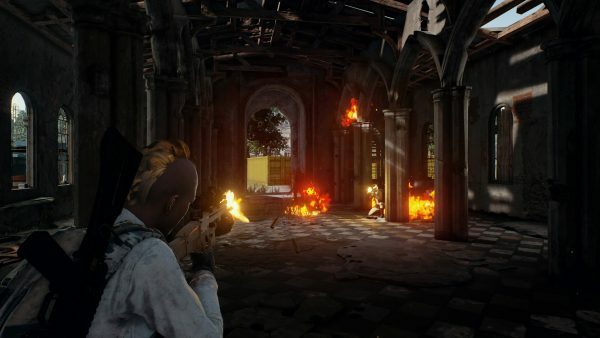 Weapons are a mixed blessing, providing the player with the illusion of establishing defense and safe territory, but alert others to the player’s position. No matter why the player is firing, the act functionally erases any hope of remaining undiscovered. The early stretches of the game are dominated by largely harmless open fields without much threat of death by gun. However, the vast space gives players huge territory to cross when the blue closes in. As the game progresses, deaths become more frequent, with last second rushes to outpace the glacial but certain death of the blue curtain often provoking attacks of opportunity from more settled-in players. The reality of the game is that as time goes on, the play area shrinks and only the well-equipped or crafty combatants remain.The tension never eases up, only grows. Continued survival may misleadingly feel safer, but it is not. The island is never less deadly, just appears less dangerous. Any serenity just proves the threats are better hidden. There is a lingering violence in these moments when no bullets fly. A distinct and unending fear of observation, or of judgement. The same kind of tension that settles invisibly in a hospital, waiting for test results. Even where no one can see it, there is a very real and present tragedy that—if coming—can neither be stopped or escaped. It simply is, and will be there, no matter what. That is a type of violence that defies easy description, but in PlUnkBat settles eerily among the sights and sounds of nature. Always present. In the end, a small field becomes an intensely empty battlefield. Bodies crawl nervously within the swaying grass. Occasional grenades and gunshots pierce the dishonest serenity of the last few minutes. Conflict ends in death, one way or another, until a single victor is left. Peace disappears more abruptly than it arrives. The victory screen will automatically navigate to the menu in five minutes. In less than a minute more, a hundred will appear on the island once again. Death follows. When the opening salvo of a game is “you are probably going to die,” the feeling it imparts becomes a proverbial mountain to climb. Every action, reaction, and clever effort to improve is weighed against the constant awareness that any given behavior, innocuous or enormous, can and over time likely will end in death. There’s a mental strain to that perpetual vulnerability and conscious awareness of mortality that feels something like anxiety. Tension twinges with every sway of the grass at the crest of the next hill. Any moment could be terminal, and every decision before it a mistake, even if it was a good call to make. PlUnkBat, it seems, is something of a decent allegory for gaming culture. It’s full of violence, both implicit and explicit, prone to upsets and instability, even safe spaces turn unsafe given time, and the players who lay down quietly tend to be the least offensive. Games culture is combative. Trash talk, taunting, and psychological mind games are an expected part of the experience. Anyone who fails to display the proper signs of masculinity, to be “one of the guys” regardless of their gender identity going in, is likely to be subject to ridicule and scorn. Same as if one were to be an insufficient player. After all, those who play games are expected to be good first and foremost. What I think is most important about this allegory, though, is that playing is still fun. Despite the blood, turmoil, and threat of death, it’s a picturesque getaway. Like a forest hike, but with corpses. Visiting murder island feels a little like a vacation. There are opportunities to better understand the culture, learn a little vocabulary, and smooth over future visits. The other players are honest in their goals, and these goals are often easily parsed, even from a distance. Threats feel conquerable because their core components are made up of the same thing each player has access to. Getting better in PlUnkBat is a simple enough process, accessible to nearly everyone who hops in and takes the time to do so, and can become a learned skill with relatively little effort. Just about any videogame can be learned in the same way. In those ways, PlUnkBat and videogames are rewarding and refreshingly easy to break into. However, despite that, they’re still imperfect. Hardware and bodily limitations prevent all players from having a uniform experience, and some players are required to limit how they engage with the space because of a physical or emotional inability that they cannot overcome through any amount of technical learning. There are players who may prefer to not deal with the murky tension of such competition at all. 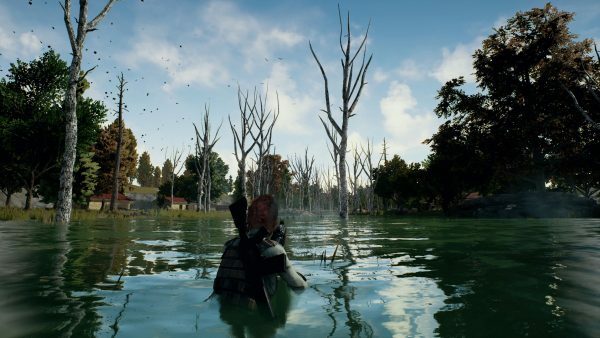 The unending barrage of racism and sexism prompt many players to mute the microphones of everyone else in order to even have a hope of enjoying the experience. Games culture has gates that it keeps, culture that it fights to leave unchanged, and an unrelenting belief that because this has been so for years, it doesn’t require change. As a result, this culture feels like it has its own slowly tightening noose around it. We’re fixed in a place, unable to push too hard at our barriers because we’re aware that those around us accept them as absolute and deadly should anyone ever attempt to cross them. Our circles leave us stranded, surrounded on all sides by those who will not hesitate to attack if they sense any weakness, any hesitation, or any disloyalty. But games culture took its shape for marketing and social reasons, rather than hard and fast rational rules. In games, being out in the blue is dangerous, but things hardly needed to be this way. I don’t know a way out, only the recognition that it’s the way things are. The razor tension doesn’t need to be all-encompassing in games. Unconscious design doesn’t need to reign over the culture. I don’t think games need to necessarily be as violent, psychologically or emotionally, that it locks those “too weak” out is more a consequence of circumstance than merit. I don’t think games need to just be the thing that they are—they can also be so many other things. PlUnkBat is a game I play often, but it’s hardly the only game. The kind of tension the game deals in is better explored briefly than lived in. Yet somehow, it seems to be built on the same model that the gaming culture is locked into. Games as a whole are so much more. I’m still baffled that there’s an active population that tries to keep it so enclosed.